In September 2017, Tarak Trivedi, an emergency room doctor, and Catherine Lerer, a personal injury attorney, started seeing electric scooters everywhere. Santa Monica, California, where they live, was the first city where the scooter company Bird rolled out its rechargeable two-wheelers, which could be rented with a smartphone app and dropped off anywhere. Lime and other scooter companies soon followed. As riders zipped down the street, reaching speeds of 15 miles per hour without helmets, both Trivedi and Lerer thought of the inevitable injuries. Soon enough, victims of e-scooter accidents, both riders and pedestrians, began to show up in the ER. “I started seeing patients who had significant injuries,” Trivedi recalls. Calls about scooter-related injures poured into Lerer’s office. She says she now gets at least one new call a day. “We recognized that this is a very important technological innovation that has a significant public health impact,” Trivedi says. 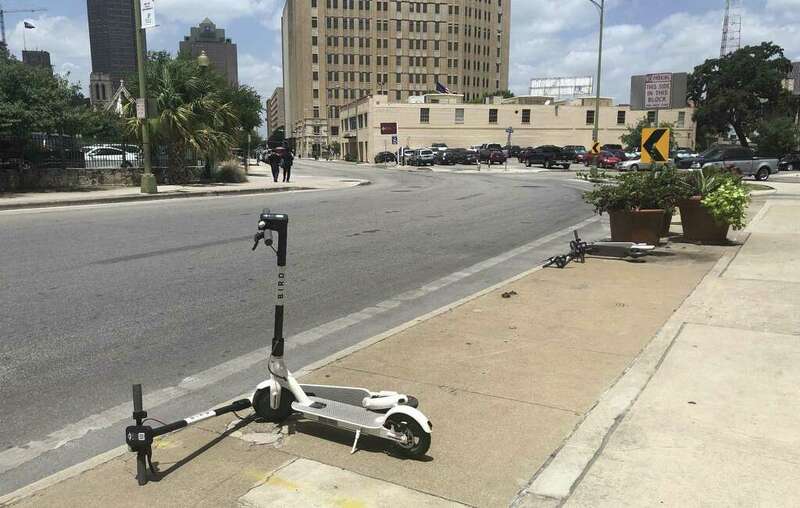 More than a year after the Birds landed, Trivedi and researchers at the University of California-Los Angeles have authored the first study to quantify the public health impact of e-scooters. Their peer-reviewed study, published in JAMA Network Open, details 365 days of scooter crashes, collisions, and wipeouts. Digging through records from two Los Angeles-area emergency rooms, the researchers found 249 patients with injuries serious enough to warrant a trip to the ER. In comparison, they found 195 bicyclists with injuries and 181 pedestrians with similar injuries during the same period. The goal of the study was to characterize how people were getting hurt, as well as who was getting hurt. Of the 249 cases the study looked at, 228 were riders, most of whom were brought to the ER after falling, colliding with an object, or being hit by a moving vehicle. The other patients were injured after being hit by a rider, tripping over a scooter in the street, or getting hurt while attempting to move a parked scooter. About 31 percent of patients had fractures, and around 40 percent suffered from head injuries. Most were between the ages of 18 and 40; the youngest was eight and the oldest was 89. While many of the injuries were minor, severe and costly injuries like bleeding in the skull and spinal fractures were also documented. Fifteen people were admitted to the hospital. That’s from California, and it’s a partial picture of what has been observed in Los Angeles, based on two emergency rooms. The authors didn’t extrapolate from there, but it’s clear there would be a lot more than just what they focused on. That’s the first study of its kind of scooter injuries, but we do have some anecdotal evidence from Texas cities where the scooters have invaded, including San Antonio, Austin, and Dallas, where there has also been one reported fatality, though it is not clear if that person (the victim of a hit-and-run) had been using the scooter at the time of his death. Let’s be clear, cars cause vastly more havoc every day than scooters do. The magnitude of injury and death resulting from our automobile-centric culture just dwarfs anything even an onslaught of electric scooters can do. In the long run, more scooters may lead to less vehicular damage, if it means more people rely on them in conjunction with transit to take fewer trips by car. That doesn’t mean we should ignore or minimize the potential for injury that scooters represent. It’s up to cities and states to figure out how to regulate these things in a way that maximizes their benefit and minimizes their risk. That means we need good data about the real-world effect of scooter usage, and we need to avoid being unduly influenced by the scooter companies and the venture capital behind them. Let’s pay attention to this stuff and be responsible about what we learn. From the Think Globally, Act Locally department. Mayor Annise Parker briefly took center stage Monday in the campaign against climate change by pledging to make America’s energy capital a laboratory for experimentation and action. Frustrated with the congressional response to global warming, Parker and the mayors of Los Angeles and Philadelphia vowed to set more aggressive targets for reducing their cities’ heat-trapping pollution while challenging others to do the same. “Mayors are uniquely compelled and equipped to lead on the fight to stem climate change, as well as to adapt to it and prepare for the impacts of global warming,” Parker said after the mayors unveiled their agenda in New York, where world leaders were gathering for a United Nations summit meeting on climate change. The mayors, all Democrats, stepped forward as the Obama administration faces Republican opposition to its efforts to tackle climate change, notably new rules that would slash emissions from coal-fired power plants, the largest source of greenhouse gas pollution. 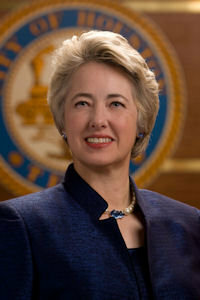 As part of the plan, Parker said Houston would lower emissions 80 percent by 2050 from 2005 levels. New York Mayor Bill de Blasio made the same pledge Friday, two days before more than 300,000 people marched through the city in what was possibly the largest climate-related rally ever held. Houston already has made significant cuts by reducing energy use in its public buildings, adding hybrid and electric-powered vehicles to its fleet and replacing 165,000 streetlights with more efficient light emitting diodes, or LEDs – a project city officials call the largest of its kind nationwide. Houston also is the nation’s leading municipal purchaser of renewable energy, with 50 percent of its power coming from wind and solar sources. And it’s likely that the city will buy even more before Parker’s term ends in 2016, said Laura Spanjian, the city’s sustainability director. Mayor Parker’s press release for this is here. I couldn’t find a website for the Mayors’ National Climate Action Agenda, but a Google News search shows they’ve been busy. Some of the Houston initiatves, like the ones for LED streetlights and electric cars, are things we have discussed here before. Some of them are things the city can do on its own – and remember, anything that saves energy also saves money, meaning it’s a painless way to cut costs – and some of them are things the city helps provide to enable its residents to use less energy, like improving the bike infrastructure. There’s no one silver bullet here, just a lot of big and small ideas that will add up to a lot in the long run. I feel like we’re still on the tip of the iceberg, but that a lot more of this is coming soon. Students in the Los Angeles Unified School District will receive 31,000 free iPads this school year under a new $30 million program launched by the district. The goal is to improve education and get them ready for the workforce with new technology skills they are not getting at home. The first deployment phase is underway now in 49 of the district’s 1,124 K-12 schools. 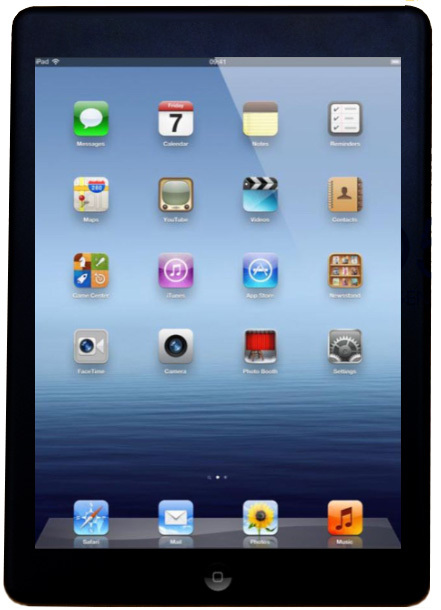 Each student is receiving an iPad pre-loaded with educational applications and other programs that will be used by the students in their studies. By the official beginning of the new school year in August, all of the students in the first phase of the project will have their iPads and won’t have to share them, said Hovatter. It’s an interesting point about how even students in a “vocational” path instead of a college-bound path need to be comfortable and familiar with computers. With all the fuss over HB5 and the legitimate concerns that graduation requirements were made too loose, perhaps a commitment to ensuring that all students get a sufficient exposure to current technology would be in order. Some school districts here already have plans for iPads or laptops for their students. I hope that this becomes standard issue for all in the near future. If nothing else, there are now enough school districts experimenting with these tools that we should begin to have a pretty good idea of how best to use them going forward.